Abbé Joseph-Marie Terray [1715-1778], Paris; by inheritance to his nephew and heir, Abbé Cecroy de Terray; (estate sale of the elder Abbe Terray, Hotel d'Aumont by F.C. Joullain & Sons, 20 January 1779, no. 27, withdrawn). Marquis Joseph-Henri Costa de Beauregard [1752-1824], Chateau de Beauregard, Savoy. his great-grandson, Marquis Charles-Albert Costa de Beauregard [1835-1909], La Motte-Servolex, Savoy. Charles J. Wertheimer [1842-1911], London. David David-Weill [1871-1952], Neuilly-sur-Seine, by 1925; consigned to (Duveen Brothers, Inc., London, New York, and Paris); purchased 1949 by the Samuel H. Kress Foundation, New York; gift 1952 to NGA. The early provenance is discussed in detail in Ulrich Middeldorf, Sculptures from the Samuel H. Kress Collection: European Schools XIV-XIX Century, London, 1976: 105-106, no. 1674, entry by Charles Avery. For these two names, Charles Avery's entry (see note 1) references a "written communication from Duveen's and M. Minet, secretary to Madame D. David-Weill, Neuilly-Sur-Seine." See note 2, and Gabriel Henrist, "La Collection David-Weill," L'Amour de l'Art, 1925: 14. Duveen Brothers Records, accession number 960015, Research Library, Getty Research Institute, Los Angeles: Series II.A, Files regarding works of art: reel 86, box 231, folder 14, Clodion, Poetry and Music, Vestal or Goddess of Fire, marble groups; Series II.I, Collectors’ files, reel 297, box 442, folder 2, Pierre David-Weill; copies in NGA curatorial files).The Duveen bill of sale to the Kress Foundation is dated 28 June 1949; copy in NGA curatorial files. Nineteenth-Century Sculpture, National Gallery of Art, Washington, D.C., 1974, unnumbered checklist. Guiffrey, Jules. Les Caffieri. Paris, 1877: 221. Thirion, Henri. Les Adam et Clodion. Paris, 1885: 275, 391, 393. Lami, Stanislas. Dictionnaire des Sculpteurs de l'Ecole française au dix-huitième siècle. 2 vols. Paris, 1910-1911: 2: 147. Réau, Louis. "Une statue de Pigalle retrouvée: la Moisonneuse ou l’Abondance.” Revue de l'Art ancien et modern 39 (January 1921): 50-62, esp. 62. Réau, Louis. "Un sculpteur flamand francisé du XXVVVisiècle: Tassaert (1727-1788)." Revue belge d'Archéologie et d'Histoire de l'Art 4 (1934): 289-309, esp. 298. Paintings and Sculpture from the Kress Collection Acquired by the Samuel H. Kress Foundation 1945-1951. Introduction by John Walker, text by William E. Suida. National Gallery of Art, Washington, 1951: 260, no. 117, repro. Hodgkinson, Terence. "French Sculpture at Waddesdon." The Burlington Magazine 101, n. 676/677 (July-August 1959): 255-259, esp. 256. Paintings and Sculpture from the Samuel H. Kress Collection. National Gallery of Art, Washington, 1959: 452, repro. Summary Catalogue of European Paintings and Sculpture. National Gallery of Art, Washington, 1965: 149. European Paintings and Sculpture, Illustrations. National Gallery of Art, Washington, 1968: 131, repro. Hodgkinson, Terence. Sculpture (The James A. de Rothschild Collection at Waddesdon Manor). London and Fribourg, 1970: 18-19. Scott, Barbara. "Charles Alexandre Calonne, Economist and Collector." Apollo (January 1973): 87, repro. fig. 2. Middeldorf, Ulrich. 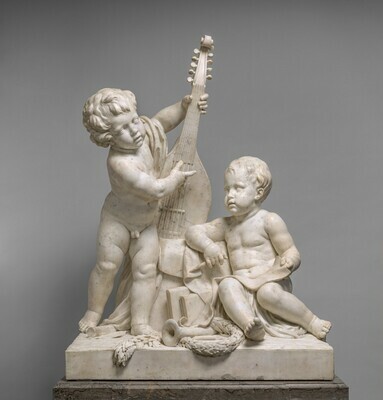 Sculptures from the Samuel H. Kress Collection: European Schools XIV-XIX Century. London, 1976: 105. Katz, Lois, ed.. Finger Prints of the Artist: European Terra-Cotta Sculpture from the Arthur M. Sackler Collections. Cambridge, MA, 1981: repro. fig. 24. Ford, Terrence, compiler and ed. Inventory of Music Iconography, no. 1. National Gallery of Art, Washington. New York 1986: no. 163. Bailey, Colin. "Mécénat privé? Mécénat public? L'abbé Terray, collectionneur de sculptures contemporaines." In Clodion et la sculpture française de la fin du XVIIIe siècle. Actes du colloque organisé au musée du Louvre par le service culturel les 20 et 21 mars 1992. Paris, 1993: 202-203, fig. 6, 219 n. 35. Sculpture: An Illustrated Catalogue. National Gallery of Art, Washington, 1994: 46, repro. Norman Herz, Katherine A. Holbrow and Shelley G. Sturman. 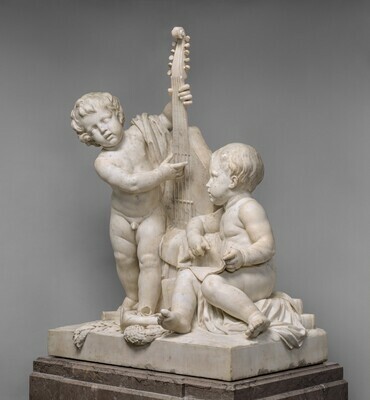 "Marble Sculture in the National Gallery of Art: a Provenance Study." In Max Schvoerer, ed. Archéomatériaux: marbres et autres roches: ASMOSIA IV, Bordeaux, France 9-13 october 1995: actes de la IVème Conférence international de l’Association pour l’étude des marbres et autres roches utilizes dans le passé. Talence, 1999: 101-110. National Gallery of Art Special Issue. Connaissance des Arts. Paris, 2000:61. Gopnik, Blake. "A Very Full Week at the National Gallery, Five Full Days of Permanent Pleasure." The Washington Post (27 December 2004): C1, C2, repro. The Arts of France from François Ier to Napoléon Ier. A Centennial Celebration of Wildenstein's Presence in New York. Exh. cat. Wildenstein & Co., Inc., New York, 2005: 66, fig. 93, 75 (not in the exhibition).